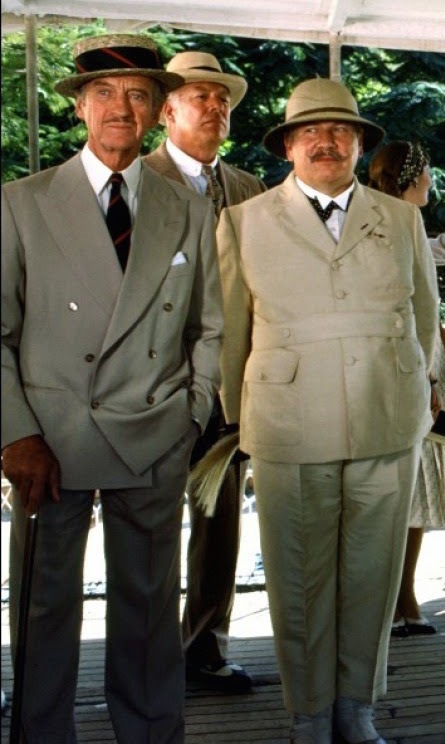 Poirot’s “boy Friday” to help him solve the case came in the form of Colonel Race, a steadfast Brit who first appeared in Christie’s earlier novel The Man in the Brown Suit. David Niven affably portrays the capable colonel with dignified charm and deadpan wit, often serving as the straightforward foil to Peter Ustinov’s more bombastic Poirot. The dignified Colonel Race shows an equally dignified approach to his wardrobe, dressing in timeless and well-tailored menswear staples including a classic black tie ensemble and a well-cut navy blazer. 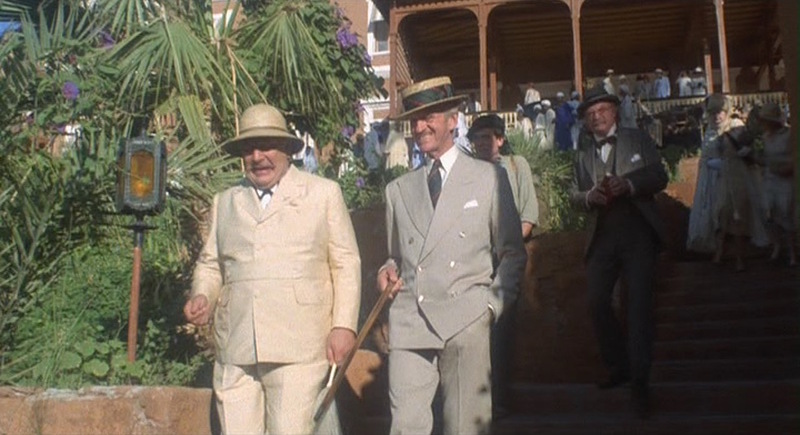 When boarding the Karnak for the group’s Nile voyage, Race sports a light taupe gabardine suit, straw boater, and regimental stripes. 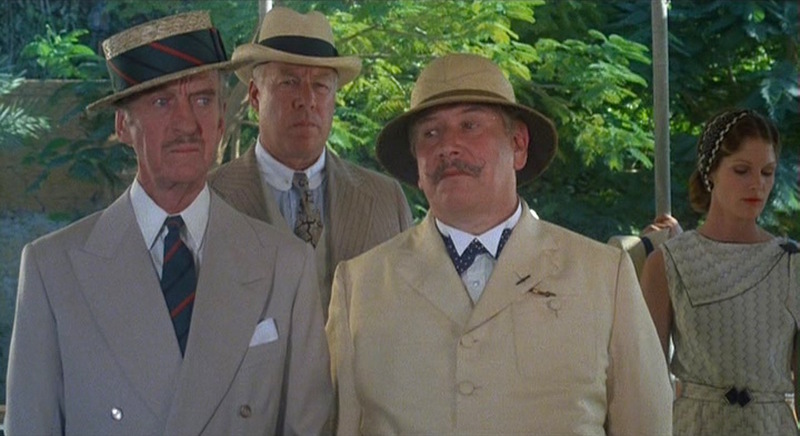 Poirot and Colonel Race prepare for their journey. Colonel Race’s suit jacket is in the traditional double-breasted style of six smoke buttons with two to button, although Niven occasionally wears the jacket à la Kent with just the bottom button fastened, allowing for a longer lapel roll. The peak lapels themselves are quite wide and full-bellied with long gorges and an especially long buttonhole on the left lapel. The jacket is ventless, per 1930s fashions and the typical double-breasted cut, with padded shoulders and roped sleeveheads. 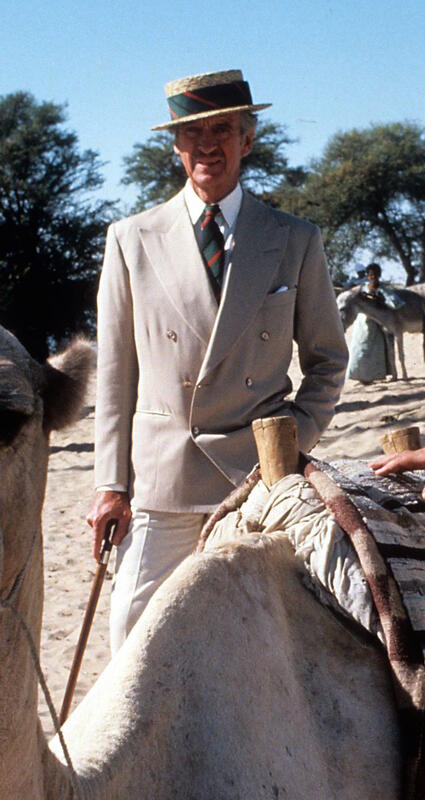 The hip pockets are jetted, and the welted breast pocket contains a white linen pocket square that would serve a useful function for a gentleman sweating it out during a hot Egyptian expedition. When wearing the full suit with matching trousers, Colonel Race also sports a natty pair of black-and-white leather spectator shoes with black laces and a black toe cap. When the excursion party goes inland by camel for a day of exploring the wonders of ancient Egypt, Colonel Race dresses down with white ducks and white bucks. The cream gabardine trousers have double forward pleats and a wide straight leg for a comfortably large fit. The bottoms are finished with cuffs (turn-ups). Assuming that they’re the same trousers he later wears with his navy blazer aboard the Karnak, they would have four white buttons – two on the front, two on the back – that connect with his brown woven suspenders. Colonel Race also leaves his black-and-white spectator shoes in his stateroom, opting for a pair of white leather five-eyelet perforated cap-toe derby shoes that, with his light tan socks, nicely complement his cream trousers. 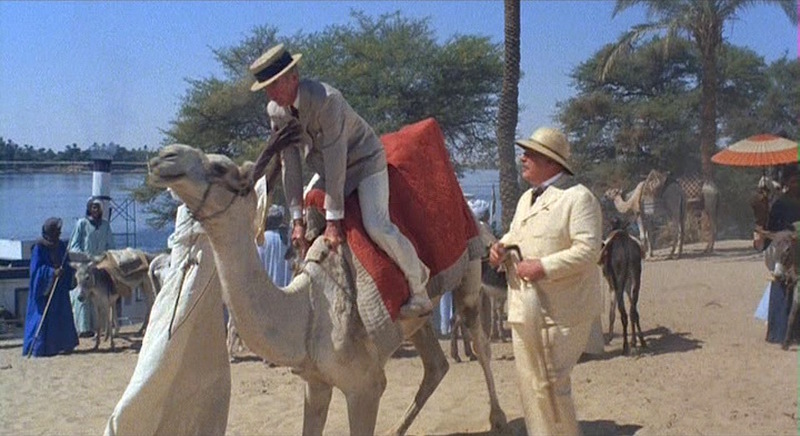 Luckily, Colonel Race’s hat isn’t enough straw to break this camel’s back. Colonel Race wears a white poplin shirt with a semi-spread collar, front placket, and double (French) cuffs with gold cufflinks. As he proudly and correctly uses his rank in civilian life, Colonel Race wears only one long tie throughout Death on the Nile – the Royal Green Jackets’ regimental striped tie of red and black stripes on a forest green ground (like this one), an obvious choice for a proud officer that served in that regiment. Even the wide band on Colonel Race’s stiff straw boater is striped with the distinctive Royal Green Jackets regimental stripe. There’s only one problem: the Royal Green Jackets weren’t formed until 1966, three decades after Death on the Nile is set. 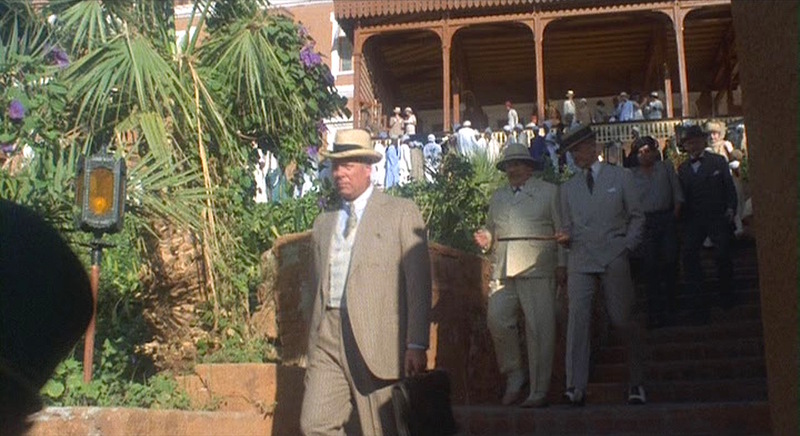 Though Colonel Race, Andrew Pennington (George Kennedy), and Hercule Poirot (Peter Ustinov) are all adequately dressed for a sightseeing tour in late 1930s Egypt, only Colonel Race’s ensemble – straw boater aside – is truly timeless. Also note Lois Chiles looking pensive over Peter Ustinov’s left shoulder; the following year, she would star as “Bond girl” Dr. Holly Goodhead in Moonraker. Niven himself had served with the Rifle Brigade, the light infantry regiment from which the Royal Green Jackets descended. Niven almost certainly wears the Royal Green Jackets’ regimental stripe throughout the film as a tribute to his service in the Rifle Brigade. Colonel Race wears all of his jewelry on his left hand – a gold signet ring on his left pinky and a gold wristwatch with a gold bracelet. Colonel Race dresses with the sophisticated dignity that one would expect from David Niven. His timeless outfit pays homage to British military heritage while also exploring the virtues of versatility when dressing for warm weather. It’s a nice touch that he reuses the jacket as a casual separate. If anything, it might look better that way than as part of a suit. On a different topic, I think Colonel Race first appeared in The Man in the Brown Suit rather than Cards On The Table, not that I’d particularly recommend bothering with it. You’re quite right – I overlooked The Man in the Brown Suit! Thanks for catching the mistake. Sir , how can you be sure that the cream trousers are Gabardine ? Couldn’t they also be linen ? The taupe suit itself is Gabardine .